Changing their labels after being caught misleading the public, without so much as an apology to their customers for the years of deception via misleading labels, does not constitute progress in our view. "At least living up to the labeling!" If left unchecked, Woolworths will continue to bamboozle customers. If you feel the same way, please write to Woolworths, attention: Justin Smith asking them to please commit to selling milk from cows that DO roam freely & graze in pasture – and to apologise to South African consumers for misleading them for so long. You can email custserv@woolworths.co.za and cc GRASS at sonia@grass.org.za and media.team@activist.co.za so that we can monitor responses. While Grass is not aware of any EU Organic legislation being broken by Homesek– the main or only Woolworths organic milk supplier – or non compliance with the minimal protocols of EU Organic Legislation, we would like to ask Woolworths the following questions. This is the first obfuscation in the attempt at damage control. 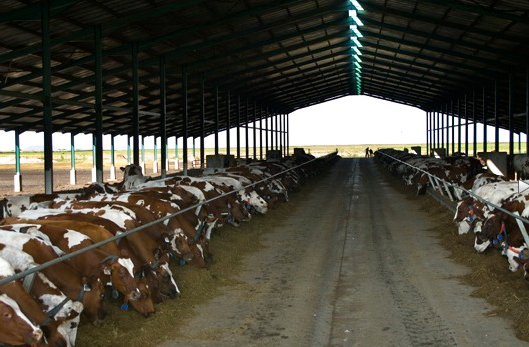 The farm depicted is not the typical organic milk dairy farm. 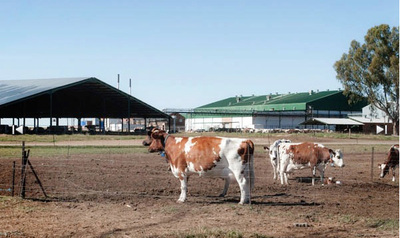 Below are images of the typical Woolworths organic dairy milk farm, where ALL of their organic milk is produced. 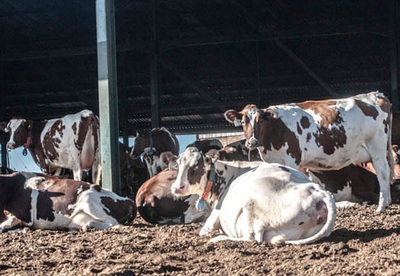 There are no "typical Woolies dairy" farms as the farming conditions vary from region to region. They admitted that only about half of Woolworths Ayrshire cows are pasture based, and the other half are barn based, and given supplementary feed which can include GMO. With regard to their Organic dairy, Woolworths admitted that although their organic cheese and yoghurt was produced from cows that roam freely and graze in organic pastures in the Cape and Natal, Woolworths organic fresh milk all comes from a single farm in Bloemfontein, where the heat and lack of rainfall means that there is not enough pasture year round. Consequently, Woolworths organic milk cows spend the majority of their lives in barns, where they are fed organic feed. Is your Organic Milk Really Organic? This is widely regarded as the minimal organic standard.This may tick the boxes in terms of EU minimum standards and EU climatic conditions, but it fails to meet the expectations of many paying South African Conscious Consumers, who view organic food as food which is farmed in harmony with nature, where there is a high regard for the environment and animal welfare. This is how Woolworths can make unsubstantiated claims because the consumer is unaware of the varying organic standards and protocols of producers and retailers. Free-range and organic draft legislation has been sitting with government for five years. Once South African organic standards are ratified, will Woolworths abide by them or continue to follow their in-house “Farming for the Future” or “Milking for the Future” standards? Is Woolworths seeking to impose their own standards on government to enable their producers to meet their in-house protocols under the minimum EU organic legislation? If Woolworths is serious about Milking for the Future and Good Business Journey why do they opt for the minimum legal standards? Why not at least AIM for the Soil Association standards that guarantee the highest levels of organic animal welfare standards. Why choose the lowest? Who are these independent experts and third party auditors? Have they been approved by WTO to certify organic? a) Please define “access” since you have admitted that the organic milk cows in Bloemfontein are kept in open barns but don’t venture out due to the heat barrier and there are no trees for shade. b) We would like to know how often the organic certifier visits this farm a year. c) How has the organic certifier determined the frequency and number of cows “accessing” pasture. d) How is ‘access to pasture’ defined? Is it via feeding grass in troughs or roaming and grazing on pasture? e) What is the stock density? g) What happens to your male calves? h) What about weaning? Woolworths removes the organic calves from their mothers at 3 days. Soil Association state that the minimum for weaning is 12 weeks of age. Please explain your reasons for this low standard. i) The feed is spoken of being organic, but are the cows? j) Who are the vets that you mention state that calves feel no pain if de-budded without anaesthetic by two weeks? "Pain associated with dehorning is significant and there is no evidence that less pain is perceived when we perform surgeries at younger ages in precocial species (those which are born ambulatory and relatively independent versus those such as humans that are dependent for a period of time)." See link. Homesek, has 2000 Ayrshires cows, Woolworths has stated to Grass in writing, that all their organic milk comes from one supplier in Bloemfontein. Are the organic cows therefore the Ayrshire cows? If Woolworths is sourcing both organic and Ayreshire from Homesek’s same pool of cows then why label and price differently? Not all of Homesek’s milk originates on the Homesek farm. How does Woolworths substantiate every single farmer and supplier of milk? Do you lie on your milk labels? Which label? You changed your labels every single time Grass queried their accuracy. Was your Woolworths organic fresh milk label which said “Produced from cows that roam freely and graze in organic pastures” accurate and true? Please address this very crucial question. Woolworths admitted that the labeling and marketing image of pasture grazing cows related only to the farms of their organic cheese, yet this image was used on ALL packaging for ALL dairy products. While Woolworths’ in-house definitions and standards for organic adhere only to the minimum of EU organic requirements, their marketing has proclaimed some of the highest animal welfare and organic standards. If Woolworths is serious about Milking for the Future and Good Business Journey why have they opted for the minimum legal standards, why not for Soil Association dairy standards instead? Many South African consumers are unaware that retailers and producers set their own organic and free-range protocols, since there is no organic legislation in South Africa. EU organic dairy protocols are vague at best, unlike the organic standards of the Soil Association, which has clear and strict protocols. Not true. Just how ignorant do Woolworths think South African consumers are? As was revealed by the recent donkey meat scandal, South African consumers are at the mercy of a lack of control regarding food safety and food control. SA’s labeling legislation is woefully inadequate – evident in Woolworths being allowed to not give specific information on colourants and additives in their food products – and not enforced due to lack of manpower. Organic and free-range claims are rampant and often unsubstantiated, especially since these terms are not governed by any laws in South Africa. Concerns about government having the capacity to implement the proposed amendments to the regulation relating to food labeling have already been raised. “Labeling enforcement falls under the department of health, the Consumer Protection Act falls under the department of trade and industry, and the agricultural product standards and meat safety fall under the department of agriculture. The respective departments probably don’t have the manpower to sustain a firm hold on compliance of the requirements, so the policing is not what it should be. As can be seen from recent reports and research, these laws are not uniformly obeyed or enforced.” – Herman Blignaut, an attorney with copyright experts Spoor & Fisher, quoted on the meat labeling scandal. Woolworths, who in government checks your labeling on an ongoing basis? Do Woolworths have ALL their labels verified, if so, by whom? Actually, consumers need accurate information on labels at all times, not only when customers complain or when DAFF instructs Woolworths to do so. Only now, after consumer pressure, has your packaging been updated to reflect the reality – “Produced from cows that have access to feed and water" and "Produced from cows that feed on organic feed"
Either Woolworths should admit to misleading consumers with their previous claims or your Good Business Journey is in reverse. Why aren’t all your cows pasture raised? Excuse me? In this “ typical Woolworths example” the cows are not even standing on grass. Where are the pastures? If your cows can’t graze in fields every day of the year and in every part of South Africa as you say, then why did your marketing and labels imply that they do? Woolworths has admitted to Grass that only about 50% of your Ayrshire milk is produced from "pasture based" cows. Woolworths has also admitted that your organic milk cows spend the majority of their life in barns. So how is it fair to label Organic milk as : “Produced from cows that roam freely and graze in organic pastures.”? Or how is it fair for TASTE magazine to say : “Ayrshire herds…spend their days in tranquil green pastures with access to plenty of good food and fresh, clean water.” Your marketing is simply not fair and does not allow consumers to make an informed choice. Good organic farmers are encouraged to select breeds that can adapt to local conditions. Woolworths’ cows are mainly Ayrshire cows from Scotland. Have they adapted to local conditions? Free-range lifestyle is considered vital in best practice organic certification. If Woolworths were serious about animal welfare and organic standards, these milk farms would be in the cooler areas of the country, instead of the hottest. 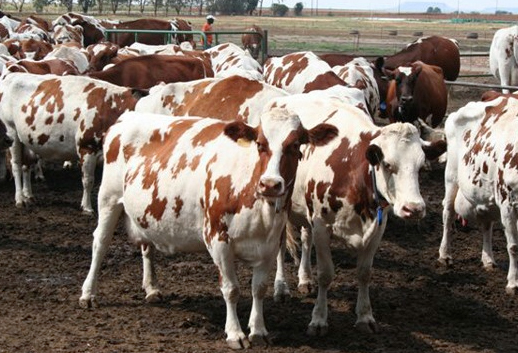 When asked, Woolworths maintained their farms were located in such hot areas, to ensure the freshness of the milk. Grass would like Woolworths to expand on this explanation since refrigerated trucks have been used in the past. Woolworths, please stop insulting the intelligence of your customers. Consumers who choose organic milk expect the cows to roam freely, and graze on pasture as your label erroneously proclaimed for so many years. Why then does Woolworths source all it’s organic milk from one farm in the Free-State, where heat and lack of rainfall and pasture are such that cows can’t roam freely and graze in organic pastures? Wouldn’t it make more sense to do what you claim in your video, and provide people with organic milk from regions that they are close to, and where climatic conditions are such that the cows can be pasture based? We, your customers have been entitled to this information for years, so we’re pleased to see that finally you have been forced to come clean on your ‘free to roam’ marketing statements and images. Consumers should also know that most of the grain-based diet includes GMO feed. But this is how your organic milk cows are housed. With not a blade of grass for them to 'roam on'. Why do you dehorn your cows? “Calves are playful animals with a specific social and hierarchical structure, that causes them to compete for position that often results in injury. … To prevent any potential injury, the calves are dehorned at the earliest possible age, under local anesthetic and proper supervision. A veterinarian needs to be present to oversee the administration of anesthetic. How can Woolworths guarantee that anesthetic is administered in all dehorning procedures? Do you have documentation showing this? Which vets told Woolworths that the calves feel no pain if debudding is preformed before two weeks of age? Grass would like Woolworths to supply the names of these vets. See here for information on pain experienced during this process. Consumers can watch a video on debuding here where it is clearly states that there is a need for anaesthetic due to experienced pain. "Must be done under anaesthetic"
Grass is aware of CIWF collaborating with Woolworths to develop the set of “Milking for the Future” standards. Are CIWF therefore onboard with dehorning or debudding? The statements by CIWF on dehorning, along with statements by Food & Agriculture Organization of the United Nations and the UK Department for Environment, Food and Rural Affairs speak for themselves on this issue. as amended, it is an offence to disbud calves or dehorn any cattle without the use of an anaesthetic other than when chemical cauterisation is used. Chemical cauterisation may only be used during the first week of life. The Department for Environment, Food and Rural Affairs in the UK. (see here for whole section). Again, what is so secretive about Ayrshire products and Woolworths "Organic" milk. Why can’t Woolworths supply the name of all their suppliers?